No Man's Land (Bosnian: Ničija zemlja) is a 2001 war film that is set in the midst of the Bosnian war. The film is a parable and marked the debut of Bosnian writer and director Danis Tanović. It is a co-production among companies in Bosnia-Herzegovina, Slovenia, Italy, France, Belgium and the UK. The film won the Oscar for Best Foreign Language Film in 2001. Two wounded soldiers, a Bosniak (Čiki, portrayed by Branko Đurić) and a Bosnian Serb (Nino, portrayed by Rene Bitorajac) are caught between their lines in the no man's land, in a struggle for survival. The two soldiers confront each other in a trench, where they wait for dark. They trade insults and even find some common ground. Confounding the situation is another wounded Bosniak soldier (Cera, portrayed by Filip Šovagović) who wakes from unconsciousness. A land mine had been buried beneath him by the Bosnian Serbs; should he make any move, it would be fatal. A French sergeant (Marchand, portrayed by Georges Siatidis), of the United Nations Protection Force (UNPROFOR), gets involved in effort to help the three trapped soldiers, despite initial orders to the contrary by high command. UNPROFOR's mission in Bosnia was to guard the humanitarian aid convoys, to remain neutral and act as a mere bystander. Luckily, an English reporter arrives on scene, bringing media pressure to bear that moves the United Nations high command to swing into action to try to save the soldiers. A row between the stressed out and fatigued Čiki and Nino gradually escalates even after being rescued. Eventually, Čiki shoots Nino and is in turn shot by a Peacekeeper. Meanwhile, it is found that the mine cannot be defused. The UNPROFOR high command tries to save face: they lie, saying that Cera has been saved and they leave the area, along with the reporters and everyone else. In reality, Cera is left alone and desolate in the trenches, still immobilized by the mine. Meanwhile, the UNPROFOR commander has arranged false information to be passed to both Bosnian and Serb troops, to make them believe their enemies will be trying to reoccupy the trench at night (which each side would try to counter with an artillery barrage that presumably will kill Cera and obliterate the evidence). No Man's Land won Prix du scénario at the Cannes Film Festival, followed by numerous awards, including the Oscar for Best Foreign Language Film in 2001, while in competition with French Amélie and the Indian blockbuster Lagaan. Tanović was presented the Oscar by John Travolta and Sharon Stone. Briefly after, Tanović thanked everyone who worked with him on the film and supported its creation. He ended his acceptance speech by saying, "This is for my country". 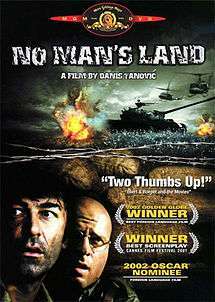 In total, No Man's Land won 42 awards, including the Oscar for Best Foreign Language Film, the European Film Academy Award for Best Screenplay, the André Cavens Award, the César Award for Best Debut in 2001 and the Golden Globe Award for Best Foreign Language Film in 2002. ↑ "No Man's Land - Trailer". fabrica.com. Retrieved 2015-05-04. ↑ "Festival de Cannes: No Man's Land". festival-cannes.com. Retrieved 2009-10-17.